Wayne W Dyer, "Pulling Your Own Strings: Dynamic Techniques for Dealing with Other People and Living Your Life As You Choose"
From the #1 bestselling author of Your Erroneous Zones, a directed and practical book that shows you how to stop being manipulated by others and start taking charge of your own life. Wayne Dyer reveals how we all can prevent ourselves from being victimized by others and begin to operate from a position of power at the center of our own lives. Asserting that we alone are responsible for how much we will be controlled by others, Dyer offers his practical plan for developing new attitudes toward the most common sources of victimization and manipulation, such as family members and authority figures in the workplace. For example, families can be tremendously coercive and demanding, but they can also be an immensely rewarding part of your life. Dyer shows how to cope with the negative side and contribute to the positive. In their working life, many people stay in unfulfilling jobs because they feel constrained by their present experience or because they fear change. Dyer shows that by being enthusiastic and flexible, you can find the work to be happy. Life, Dyer says, is a beautiful thing as long as you hold the strings. 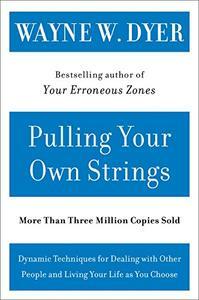 Pulling Your Own Strings will give you the dynamic strategies and tools to master your own fate.